Drivers in the Los Angeles area share the roadway with large trucks, commonly called 18-wheelers. Accidents with these trucks can be brutal, resulting in catastrophic injury and death. In such cases, the accident victim or his or her family suffers significant financial and emotional hardship. 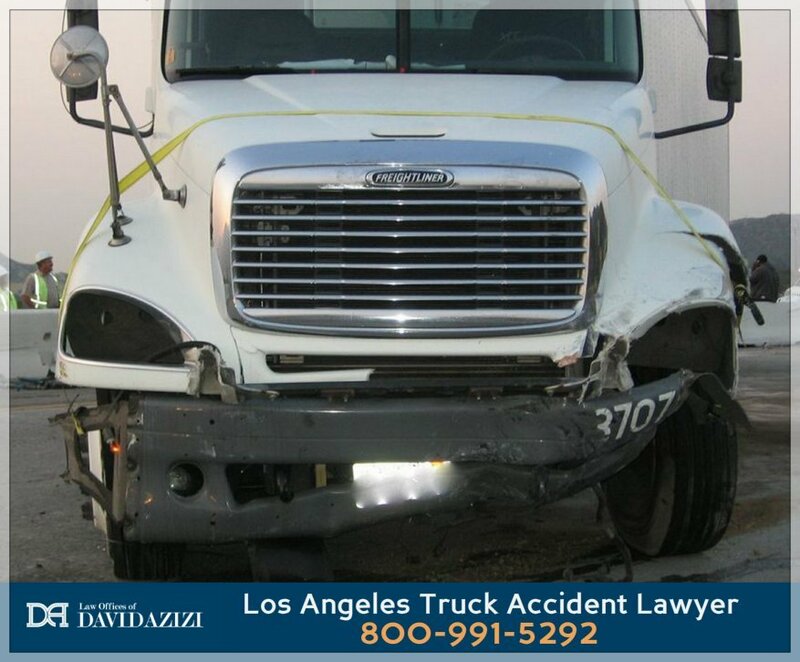 Los Angeles Tractor Trailer Truck Pile Up Accident - What a Lawyer Can Do"Law Offices of David Azizi - 1-800-991-5292 In this video David Azizi will explain some of the issues that arise when a big rig or tractor trailer is in a major pile up accident in the city of Los Angeles or anywhere in California." In the stark reality immediately following an accident or the days and weeks spent in a medical facility, individuals are unable to fight for themselves. David’s experience as an 18-wheeler truck accident lawyer and his sense of justice makes him the perfect advocate. Contacting David as soon as possible after an accident with a big rig at 800-991-5292 will take the burden of worry from you, and let him begin the process of recovering damages. There are 4.3 million commercial trucks in the United States, and a disproportionate number of these are registered in California. It is common to see big rigs on the highways around Los Angeles. Under the California Vehicle Code, the average length of an 18-wheeler is 75 feet, and these trucks weigh an average of 80,000 pounds. Contrast that with a passenger vehicle’s weight of about 4,000 pounds, and it is easy to see why 97 percent of those killed in an accident between passenger vehicles and 18-wheelers were in cars and SUVs. In fact, the number of people killed in a big rig accident was higher in California than in any other state. The Los Angeles metropolitan area, encompassing six counties with a population of nearly 20-million people, contains one of the country’s largest container ports, along with numerous distribution centers. Highways, particularly Interstates 710 and 5, have a high incidence of 18-wheeler accidents. The Department of Transportation has noted that, of the thousands of trucking accidents that occur in California each year, one stretch of I-710 accounts for nearly 30 percent of them. Truck accidents can result in serious injury. Such accidents can happen even at low speeds, particularly on ramps leading to and from major highways. In 2014, an upward trend was seen in the number of serious injury crashes from a low of 73,000 the year before to 88,000 out of the 411.000 truck crashes reported by police nationwide, an increase of 21 percent. The annual cost of injuries due to crashes with commercial motor vehicles, as reported by the Centers for Disease Control and Prevention in 2015, was approximately $99 billion. Knowing the next steps to take after an accident with a large truck or commercial vehicle is vital. 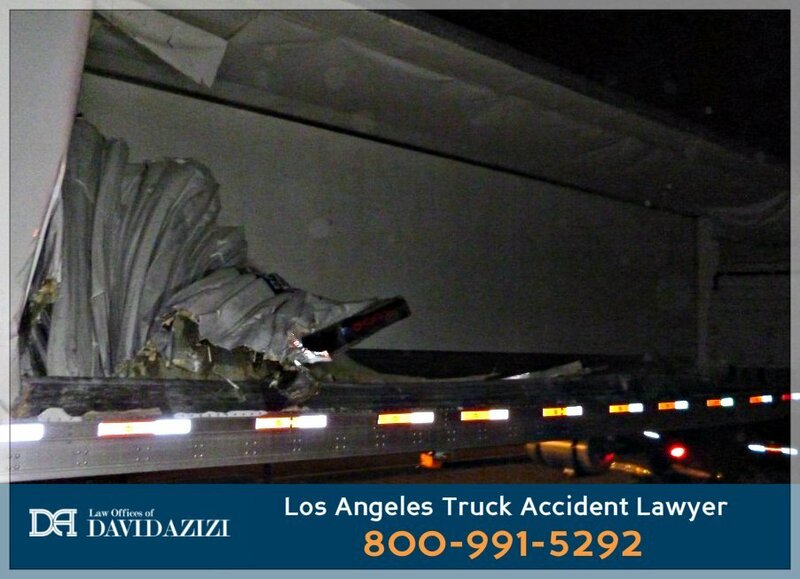 Los Angelels semi-truck crash attorney David Azizi answers the most talked about questions in this podcast episode. Play the episode below. Truck accidents can happen anywhere and at any time, yet statistics show that they happen more often during the daylight hours with the majority occurring between 12:00 p.m. and 3:00 p.m. Although adverse weather can be a precipitating factor in approximately 13.1 percent of truck accidents, 78 percent of the accidents happen without any connection to bad weather. While more truck accidents occur in areas with a higher speed limit, low-speed accidents are common, particularly on ramps leading on and off the highway. Another problem area involves a trucker’s failure to allow sufficient stopping time. A truck requires 310 feet (a football field’s length) to stop when traveling at 60 mph. Tailgating or traveling too close behind other vehicles can make it nearly impossible to stop in time. If a driver’s response time is inadequate or if the brakes are not maintained properly, the stopping distance is increased. Another factor that leads to a car accident with an 18-wheeler includes driver fatigue. This is largely impacted by the demand trucking companies make for drivers to meet unrealistic deadlines. Although federal laws dictate the number of hours a truck driver must rest, this is sometimes ignored. Failure to maintain a truck in peak working order is another consistent factor. Drivers are mandated to keep logs of truck maintenance. Loading and securing cargo properly is an essential element of trucking safety. Failure to do this can result in spills onto the highway, a negligent act that causes frequent accidents. On many occasions, the amount of cargo hauled exceeds the limits imposed on the trucking industry. Improper loading and overloading can add to the incidence of jackknife and rollover accidents. Since the causes of a truck accidents are varied, David will demand access to the logs and review them for negligence. He will check whether maintenance, cargo limits and other safety precautions have been compromised. Negligence requires that the defendant (the person or company that was at fault for the accident) failed to take reasonable care to avoid injury to other drivers. Additionally, it must be shown that the defendant failed to implement that duty, and in so doing, caused injury and financial damages to the plaintiff (the victim). Since failure to abide by safety precautions, as required in the Federal Motor Carrier Safety Regulations, is a major problem in trucking accidents, it is important to determine if the trucker or trucking company failed to implement these rules. If not, this is a breach of their responsibility to other motorists. Likewise, reckless behavior by truckers on the road is another way negligence can be defined. Driving too close behind another vehicle, speeding, changing lanes abruptly, without adequate distance between vehicles, or driving while inebriated are other factors. Failure to maintain logs, perform necessary maintenance, including inspection of brakes and tires, and getting sufficient rest as required by law are others. Trucking companies have the responsibility to screen drivers. This includes making sure drivers are trained properly and do not have a history of repeated violations. Ongoing assessment of the driver’s ability to perform his or her duties in a responsible way is essential. While the driver is the primary focus in a lawsuit for fault in an accident, the employer or trucking company may also be responsible. If the truck driver is an employee of a trucking company, then the employer may be held legally liable for the accident, along with the trucker. This is done under the Doctrine of Respondeat Superior that specifies that the employer is responsible for the acts of an employee. If the trucker is an independent contractor, the doctrine may not apply. The degree of the company’s liability is tied to the measure of supervision they have over the contractor. An investigation into the accident takes this into account, since individual defendants usually have independent insurance policies that can impact on a potential lawsuit or the way an insurance company may respond. Damages often include the victim’s medical care, including rehabilitative costs. Since injuries due to a truck accident are often serious, the financial loss may be considerable. Additionally, the individual may be unable to work for a significant length of time, if at all, and compensation for lost wages is another element of damages. In some cases, pain and suffering or punitive damages as well as future medical treatment and lost earnings may be included. In many cases, an individual is killed in a car accident with an 18-wheeler. When this happens, the family suffers both financial and emotional loss. Damages such as compensation for burial and funeral expenses as well as compensation for the support the decedent might have provided to the family need to be recovered. David has nearly two decades of experience dealing with the ravages of trucking accidents. He has handled enumerable cases successfully, returning just and ample compensation to the victims. David understands the stress and pain that occurs after such an accident and works hard to achieve the maximum compensation possible. David Azizi is there for his client’s 24/7, providing them with immediate access to him day or night. He will perform a complete investigation into the accident, using accident reconstruction and police reports, witness accounts and his own examination of the accident scene. David and his team assess the damages and determine the degree of negligence involved in the accident. He will also negotiate with insurance companies to ensure you receive just compensation. David can help you through this difficult time. Contact him now at 800-991-5292. His experience as an 18-wheeler truck accident lawyer and dedication to seeking justice for accident victims can let you rest easy knowing that your case is in good hands.